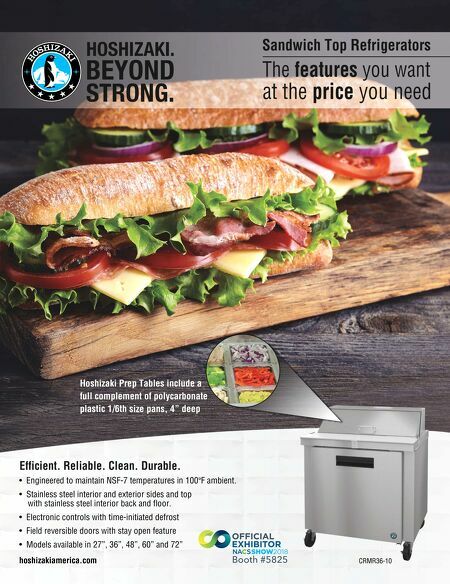 82 • FOODSERVICE EQUIPMENT & SUPPLIES • OCTOBER 2018 while its remaining 13 sites have sandwiches and roller grill items. "We used to just focus on cold deli sandwiches and lunch meat as well as our hot dog program, then we moved the roller grill behind the counter so we can customize our offer- ings," says Krebs. "As time went on, we began incorporating bone-in beef short rib, tiramisu, cannoli, full-service dis- pensed beverages and stir fry and veggie bowls prepared with induction woks." The retailer also bakes its own bread, cookies and muffins, and makes sandwiches on-site at all of its locations. About six years ago, Rutter's partnered with a mainline foodservice distributor that has its own lines and provides chef support. The system works well for this c-store chain. Krebs also credits the company's rigorous training program for its success. The staff learn how to order, pull food based on orders from the previous day and determine the amount of thawing time required for frozen items. "We cross utilize as much as possible to minimize shrink," says Krebs. "We may put something not selling on a hot hold and move it to a case, so we're not just relying on customers to Heated Display Cases ● In terms of size, most units are 48, 60 or 72 inches wide and between 24 and 36 inches deep. These units typically feature between one and three shelves to display food. ● While shelf merchandisers offer greater ver- satility, smaller snack merchandisers tend to be a better fit for front of the counter offerings. ● Merchandisers come in a variety of differ- ent decor options and include base and bumper colors, various shapes and a selec- tion of profiles for the case and base. Some manufacturers offer accessories geared to enhance the unit's efficiency, such as shelves for scales or packaging; containers or rails to hold tongs, thermometers and other accessories; or built-in thermometers for measuring food temperature. ● Typical items c-stores display in these units include cooked proteins, like whole chickens, fried chicken, turkey breast and ribs as well as side dishes such as mashed potatoes, french fries, mac and cheese, and vegetables. ● To help determine the type and size of a unit, evaluate the menu items that will go in the merchandiser. Also, look at the different product by daypart. A common mistake is specifying a merchandiser that is too large. Roller Grills ● C-stores need to look at the roller grill's dimensions and capacity to ensure it can handle the volume. Widths vary between 10 inches and 36 inches. This equipment can handle as little as 8 or as many as 75 hot dogs at a time. ● Roller grill equipment manufacturers will specify an estimated per-hour capacity in addition to the at-a-time capacity. ● Options include flat or mounted bars, the latter of which creates a slant for merchan- dising and easier accessibility; the design of corral-style units with smaller bars and flat surfaces retain hot dog juices and generally have stainless steel instead of chrome; a finish that is coarse for better gripping, and non-stick rollers. ● Electronic or manual controls are available. The more affordable manual units tend to prove more popular but electronic control variations often include time cycles, provide more consistent temperatures and have features that monitor product cooking. ● C-store retailers may want to consider bun storage and warmer units, either as a separate purchase or as a component of the roller grill. Carbonated Beverage Machines ● One of the most common mistakes in specifying beverage dispensers in the convenience channel is undersizing or over- sizing the unit. Knowing the peak demand stats will guide the buying decision as to proper size and the appropriate number of dispense points. ● For self-serve units, merchandising capa- bilities are typically an afterthought, but should be carefully assessed at the store level. Lighted signage can help encourage c-store impulse sales. ● Ice maker dispensers ratings reflect a 24- hour period vs. a more common operating cycle of a busy-then-slow-then-busy c-store environment. C-store retailers need to make sure ice makers and dispensers match the expected peak volume. ● Remember to carve out space for storing bag-in-box syrup, which feeds the unit. 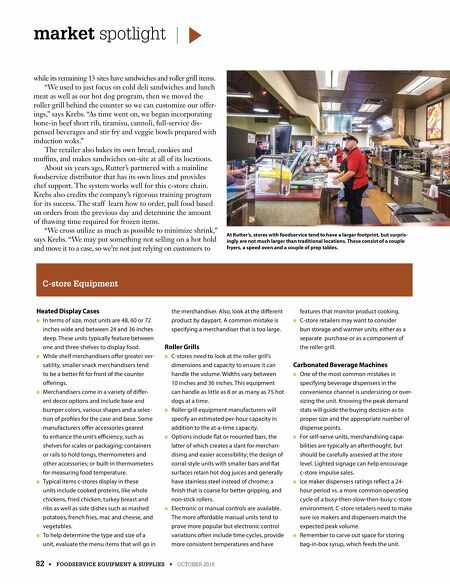 C-store Equipment market spotlight At Rutter's, stores with foodservice tend to have a larger footprint, but surpris- ingly are not much larger than traditional locations. These consist of a couple fryers, a speed oven and a couple of prep tables.